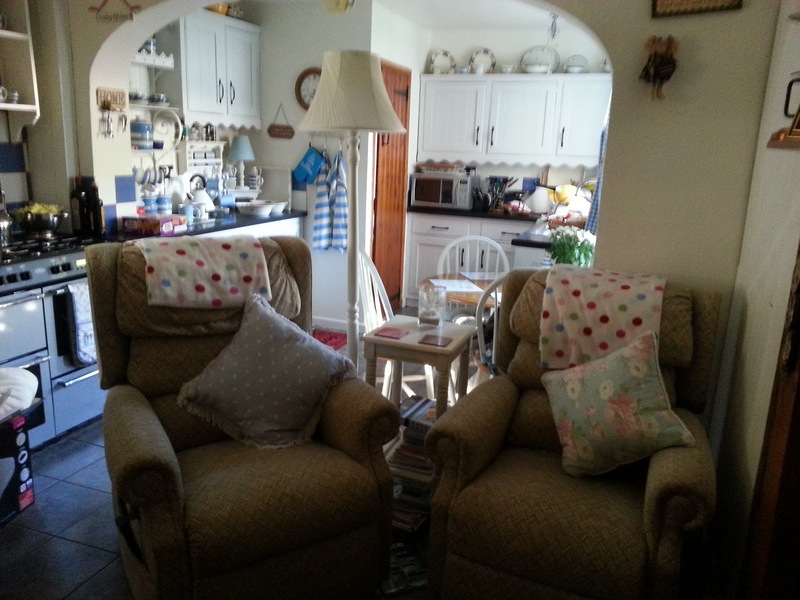 After the conservatory we decided to bite the bullet and finish it all off and do the kitchen and little lounge. 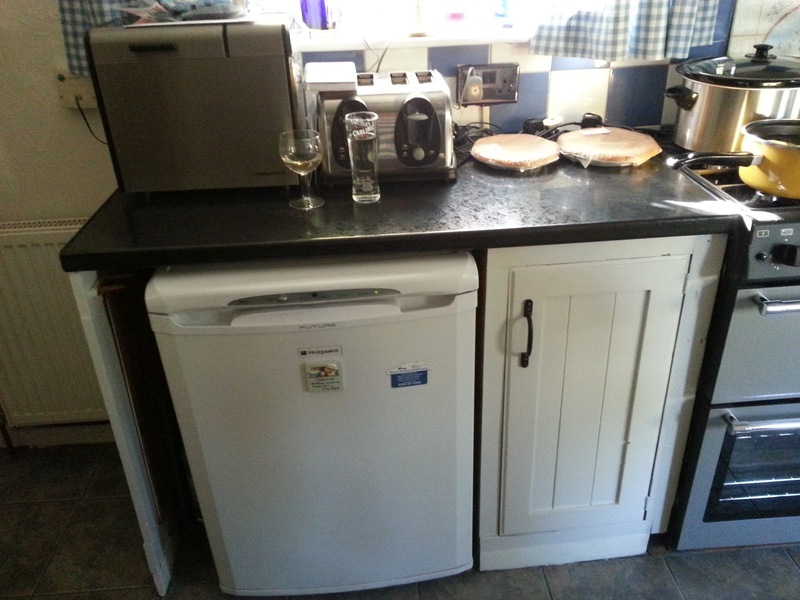 The problem with not doing 'miminalist' is where do you put all the stuff you've collected - some of it went down the cellar, some of it in the summer house and the rest in the front lounge - well for 2 weeks that's where the fridge and freezer lived. The floor in the kitchen was laminate that we put down 6 years ago so we decided to get a floor tiler in and get ceramic tiles laid - Well Chris the tiler turned up, took one look at the floor and made a sort of groan and proclaimed it goes up and down a bit doesn't it? 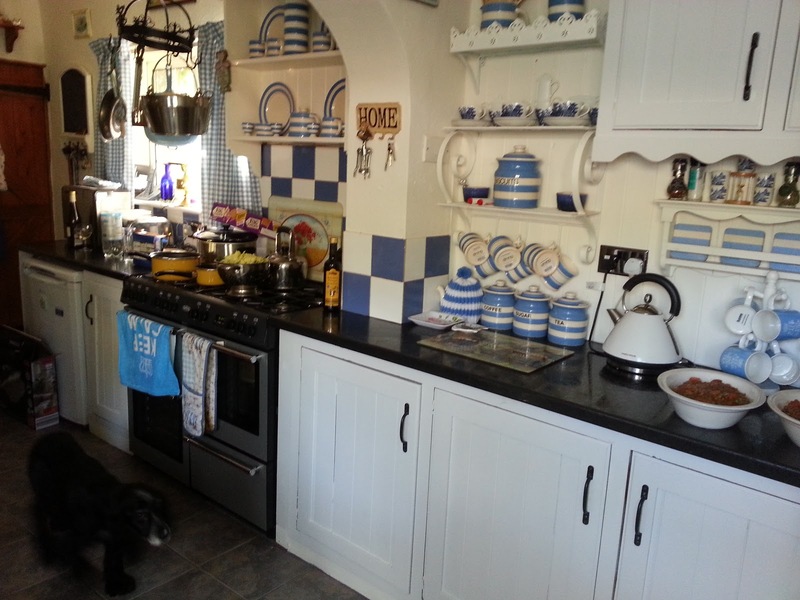 but after they'd taken up the 2 old floors (one on top of the other),levelled it, and laid the tiles, it looks brilliant and is so much easier with having the 3 dogs. But this was the worst time of all, we were in so much mess! 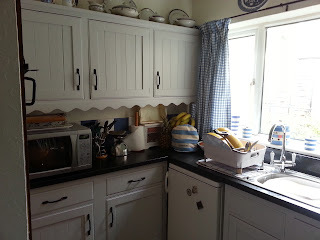 Then we moved onto the kitchen worktops - as we put more coats of the 'Blackened' on - it became apparent that the wood effect work tops weren't going to match - so it was off to Wickes with a piece of the painted cardboard in Blackened, a floor tile and one of my Cornish Blue salt cellars (I knew the kitchen tiles which we weren't going to change matched the Cornish blue exactly) and after what seemed like hours of deliberation we settled on shiny black worktops. 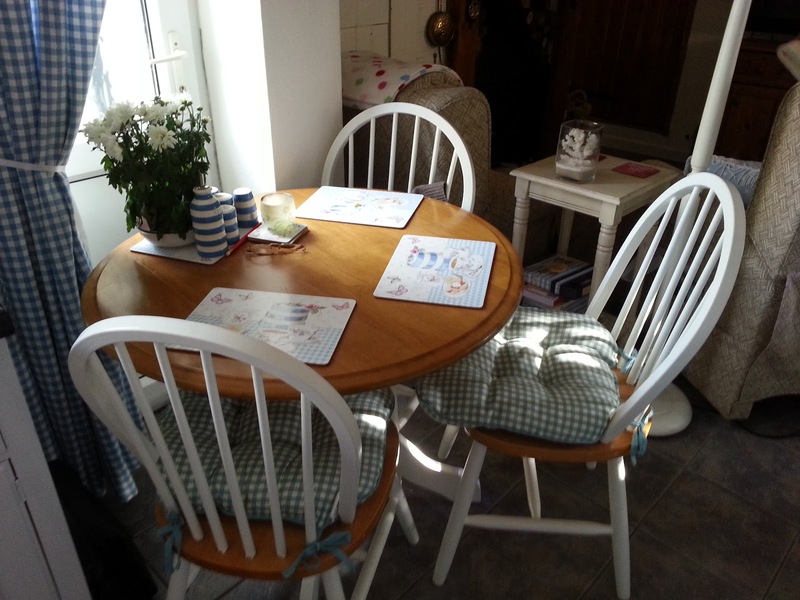 Getting a carpenter to turn up to fit them was the next battle - carpenters have 2 excuses for not turning up - it's either the van's broken down or they've just come out of hospital! the 3rd carpenter turned out to be the most reliable! After that it was a case of painting the walls (F & B Pointing again) re staining the doors changing the sockets, switches and light fittings to cool black and then moving every thing back into position. 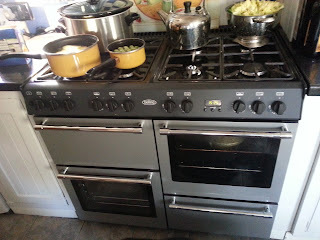 I've taken some photo's but took them when I was doing some cooking so please excuse the mess! I'd seen a dining room set in Laura Ashley which had the legs and the base of the table painted white the seats and the table top were left pine, so out the paint brush came again and I spent a whole weekend painting my old set plus a base of a standard lamp - I think it's come up well and looks just as good as one from Laura Ashley's would have done! 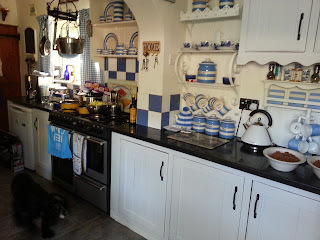 This is the other side of the kitchen - sorry about the cooking! 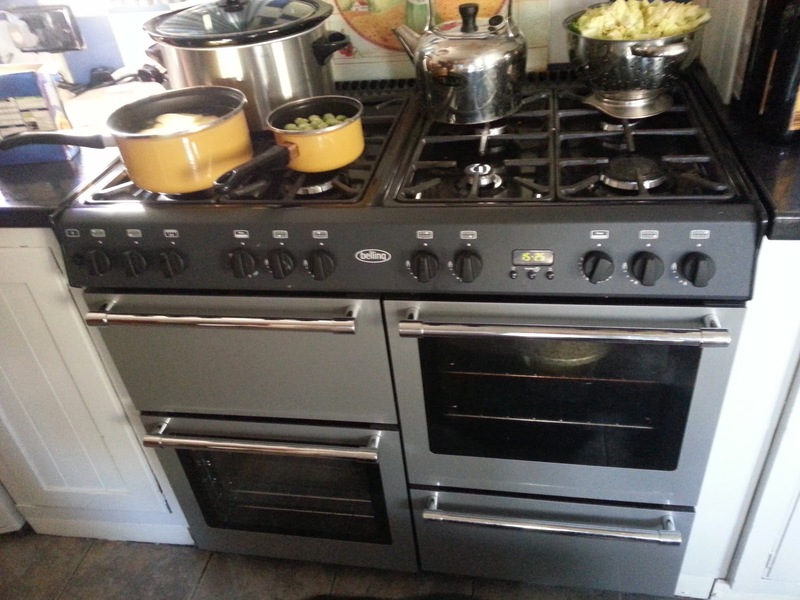 New cooker - with lots of burners and 2 ovens........ brilliant! you've worked so hard, but it all looks wonderful and very cosy. I could see myself in one of those armchairs with a cup of tea! Your kitchen makeover looks great. 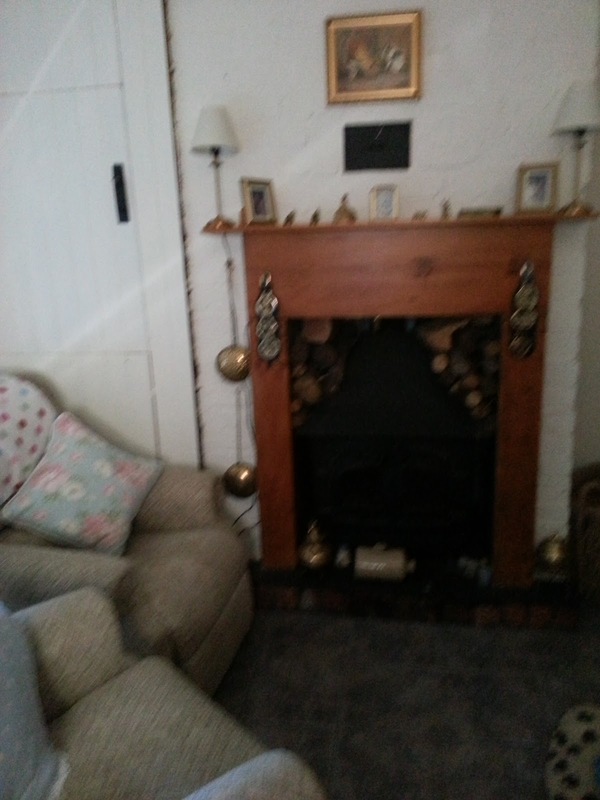 I love your sitting area and log burner. All you need now is a bed in there and you need never leave the room! 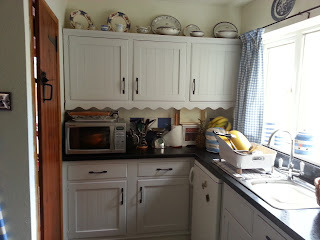 I'm coming over...I could live in your kitchen...I'll keep it tidy and you won't even know I'm there. looks great, i may get round to putting some of my pics on one of these days ! It looks wonderful-I love the colors! Looks like the perfect place to sit and be cozy on a winter evening! 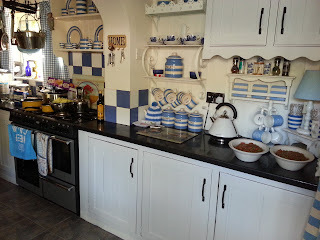 I absolutely love your kitchen.